Allright guys!! Giveaway season is here! Both my sister and I are Virgos along with some legendary designers and to celebrate the awesomeness of this star sign we will be giving away prizes all Virgo season long! All you have to do is answer our bi-weekly questions right and you can win prizes every week. Our first challenge and Virgo designer is Tom Ford. 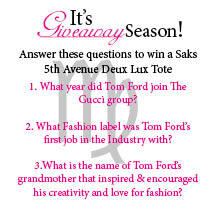 Answer these three questions right first and you stand to win a Deux Lux Tote from Saks 5th Avenue. Good Luck!! Email us, comment on the blog, tweet, Facebook or instagram us!